Into The Okavango -- An Award-Winning Adventure. Come take an African safari with us! Journey to Africa in this exquisitly photographed memoir on safari through Botswana, Zimbabwe, and South Africa. Follow also the poet's heart of darkness to her sad and life-consequential childhood secrets. Burgoyne and Burgoyne, Publishers is a small, independent publishing house, committed to publishing its own art (illustrated) and nature (photography) books. 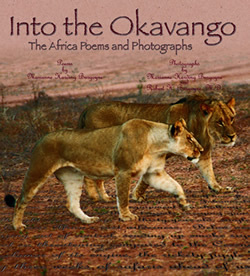 Founded in 2004 by Marianne Harding Burgoyne, President, and Robert H. Burgoyne, M.D., Vice-president, the company is currently promoting the award-winning book Into the Okavango: The Africa Poems and Photographs. Click above to order Zoobooks or Zootles today!